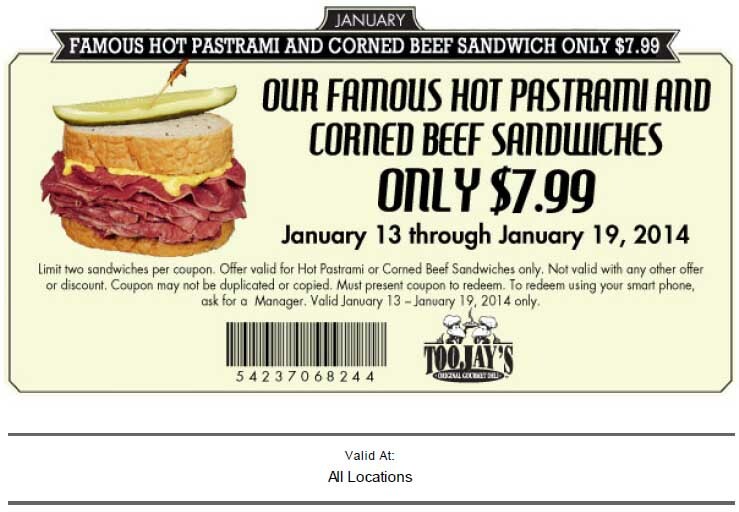 Toojay’s Coupon 2014 is now available for the famous Hot Pastrami and Corned Beef Sandwiches to make them only $7.99. That’s right, using this Toojays Coupon 2014 will save you some serious dough (no pun intended, well, actually, yes it was…). 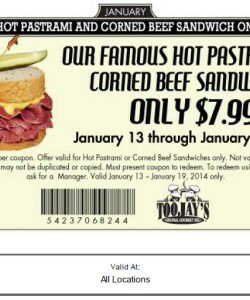 In order to get your Pastrami Sandwich or Corned beef Sandwich for just $7.99 you need to print out this coupon using your internet browser and redeem the coupon in-store just like any other coupon from Toojays. 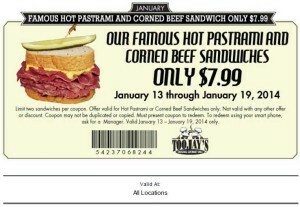 Being a famous food staple for the Toojay’s restaurants, the Hot Pastrami and Corned Beef Sandwich Coupons are limited to two sandwiches per coupon. The offer is valid for these sandwiches only. And of course, it is not valid with any other Toojays Offers. Get our Toojay’s sandwich today using this coupon in 2014! Print and save today at your local Toojays Restaurant!